The Titan is Nissan’s attempt to grab a piece of the full-size truck sales pie. 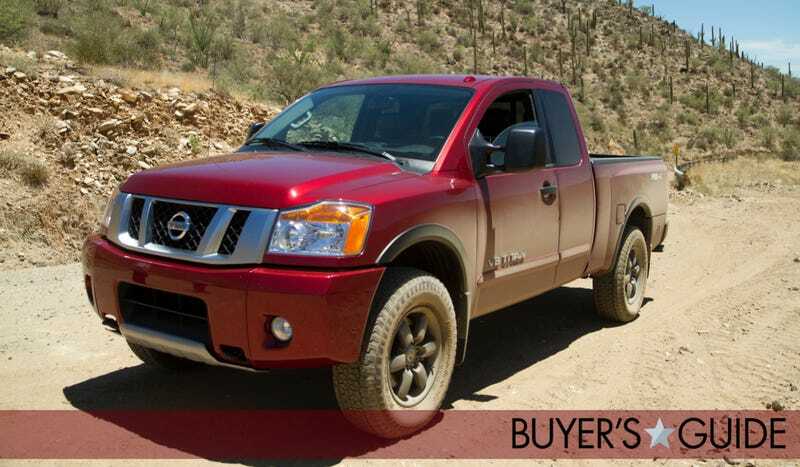 What do you need to know before you buy a Nissan Titan? Don’t worry, we’ll tell you in our Buyer’s Guide. The pickup truck segment is the best selling one in America. Ford, GM, and Chrysler have been selling hundreds of thousands of trucks each year. With archaic body-on-frame construction and big, simple V8 engines, you can bet the profit margins on trucks are huge. So, to rake in some of that coin, Nissan launched the Titan in 2004. With a bold, aggressive look and a big, 317 hp V8 mated to a five-speed automatic transmission, the Titan made quite a splash when it launched. Nissan sold over 70,000 the first three years. After that, though, sales started to decline sharply because Nissan let the truck stagnate. The Nissan of 2015 is essentially the same truck that launched in 2004. Yes, the truck is over 11 years old. And while it’s inexpensive and still handsome, it lost its competitive edge years ago. An all new Titan launches for the 2016 model year. Maybe that will bring Nissan back into the game. The new 2016 Nissan Titan hits the market in a few months. Unless you get a killer deal on the outgoing model, we’d recommend you wait to see what you think of the new truck. It’s all new and offers a burley 555 lb-ft, 5.0-liter V8 diesel which will make it the torquiest half-ton pickup in the business. The new model rides on a beefed up version of Nissan’s commercial vehicle frame. For 2016, you also get new V8 and V6 gasoline powertrain options, a new suspension that promises better ride quality, a revised interior, a new six speed Aisin automatic transmission, an available goose neck trailer hitch, and much more. The new Titan goes on sale in late 2015.